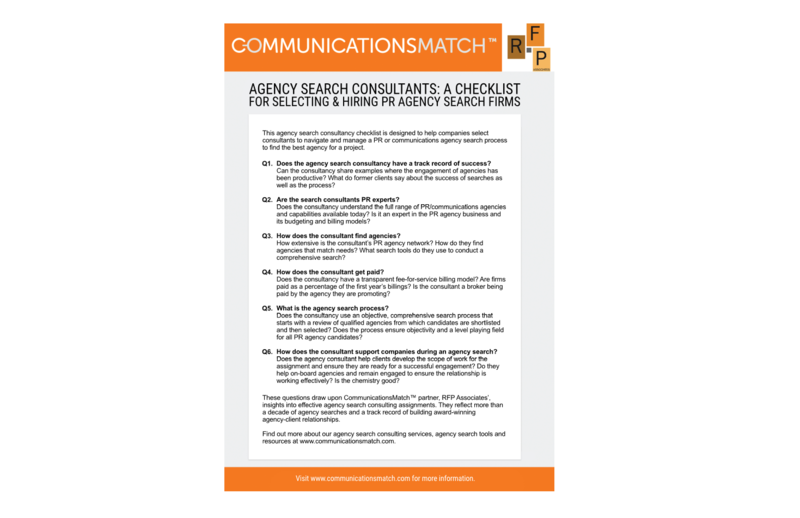 Our new PR Agency Search Consultant checklist helps companies and organizations evaluate agency search consultacies. View and download the Checklist. Developed by CommunicationsMatch™ and RFP Associates, the checklist highlights the importance of understanding the consultants' track record, business model, search process and engagement with clients throughout the search process. Download the "Agency Search Consultant Checklist" pdf below. Find out more about our search consulting services. Read our CommPRO.biz article on Questions to Ask Before Your Hire an Agency Search Consultant.